Roasted Poblano Gazpacho: The perfect summertime soup! 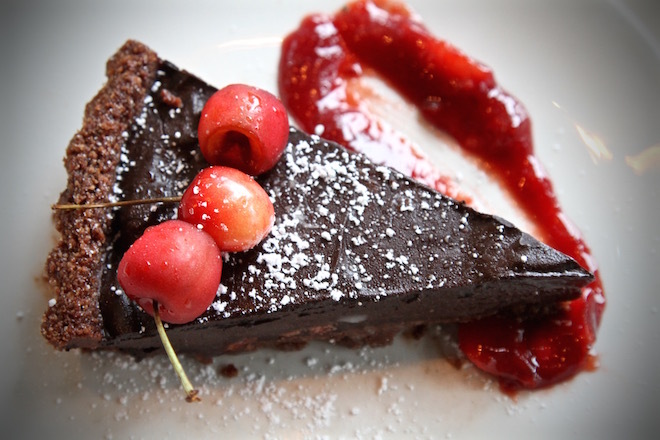 Dark Chocolate Cherry Tart with Xoco chocolate and a chipotle-cherry compote! This month, XOCO is all about bringing you flavors of the Yucatán with Midwest ingredients. “These are refreshing and bright flavors, especially in the hot days of July,” says Chef Wil Bravo. Take the escabeche salad, highlighting our house made recado blanco seasoning, a classic spice paste from the Yucatán. The seasoning does double duty: it’s a marinade for the Gunthorp Farms chicken and also factors into the salad dressing. 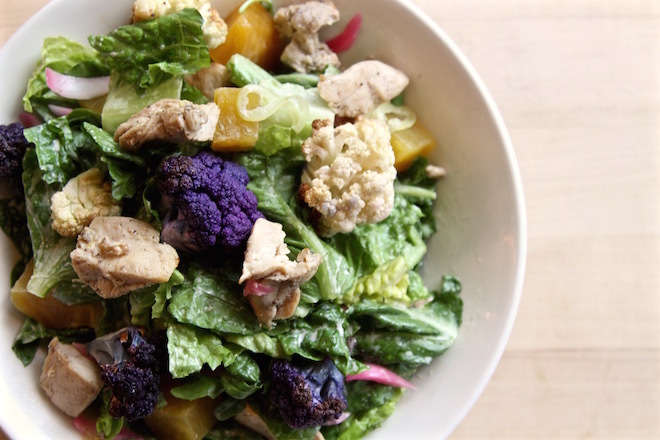 The green, a blend of arugula and romaine, are garnished with pickled red knob onions, golden beets and purple cauliflower, all from Nichols Farm. 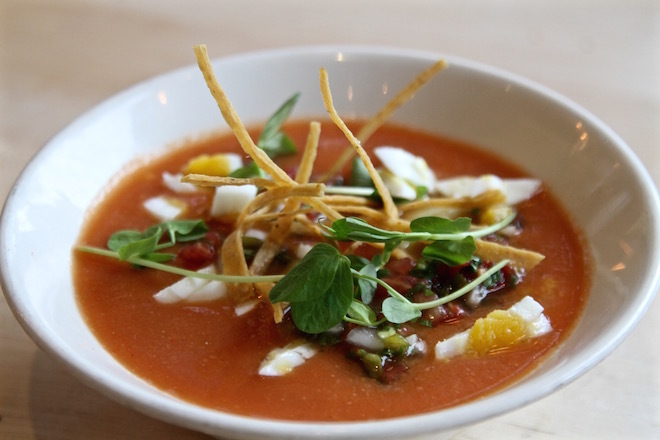 The new roasted poblano gazpacho, meanwhile, is made with raw and roasted local tomatoes from our friends and Iron Creek and Nichols Farms. It’s garnished with local cucumbers and pea shoots from our friends at Three Sisters Garden. Oh, and in true Yucatecan fashion, our chefs drop a little hardboiled egg into the gazpacho. It’s the perfect summer soup! 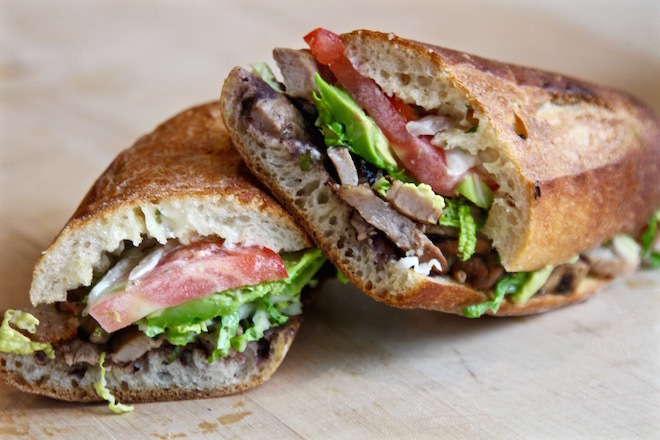 And if it’s grilled meat you’re craving, the poc chuc torta is just the thing. 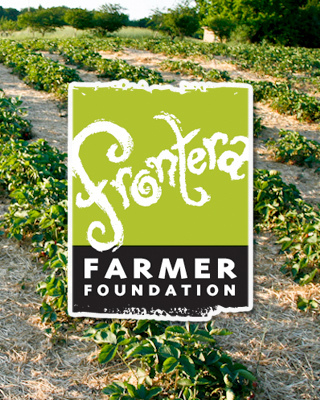 It’s a sandwich of grilled, citrus marinated Gunthorp Farms pork, local tomatoes, pickled white onions, Napa cabbage and cilantro crema — served, of course, with a side of fiery, floral habanero salsa. On the sweet side, Chef Wendy has made perhaps the best use of local cherries ever — she’s created a tart filling of cherries and Xoco chocolate, which sits nestled in a crust chocolate-graham cinnamon crust. We say this a lot around here, but do not miss this dessert! Rick, I love watching your show, one plate at a time! I would like to know what is your favorite place in Mexico to visit. My husband and I love to travel, don’t know where to go in Mexico for good food!